Are you ready to increase your competitive advantage and selling success? At 6'7" Jim is a larger than life, extraordinary, keynote personality from the moment he walks on your stage until the moment he helps your team close the sale. Let Jim make your team "competitively larger than life" in your markets! 80 different industries in 35 years, researching, improving and motivating sales teams and their leadership. Are you ready to increase your sales, competitive advantage, and selling success? Customized training to increase your team's competitive advantage, selling effectiveness and profitability. Is it finally time to turn your managers into effective sales LEADERS? Book Jim Now for Your Event! "We used Jim Pancero for our sales training, and I got to tell you what came out of it was fantastic. What I thought was going to be more salesMEN driven, it really became a sales management driven tool for us. And he was fantastic in terms of what his delivery was, in terms of how we approched our business, negotiating, and probably the biggest key take away for us has been the sales management aspect of driving our team to do better. The biggest aspect of that was account planning and being very deliberate about our account plans and how we what to attack that customer not just from a short-term perseptive but from a long-term perspective and really trying to grow that account in terms of being a mutual fantastic partner on behalf of our business. So, I would highly recommend Jim Pancero and his training methods to anyone out there that's wanting to grow their business and not just their business but to grow their profit margins as well." I'm Nat Porter with Nelson. We're a national architectural firm and we're here in our Chicago office right now which I lead. I've worked with Jim for over 15 years. The reason I keep engaging Jim is he does a couple things really well. He takes very complex processes and makes them really simple so the average person like me can understand them really quickly and easily. The second thing is, he helps you look at your process completely differently, usually from the customer's point of view, and we're typically very internally focused. The third thing Jim does exceptionally well is he can help me analyze our strategy and look at it completely differently, as an outsiders view every time I bring him in. So, thanks Jim Pancero! "I've known Jim for over twelve years and the American Institute of Steel Construction has been using Jim for almost 20 years for a variety of different things. From educating our membership on sales skills, business development, early involvement, also presentation training. And the most value that I've seen, particularly for our staff at AISC, is really homing in on their sales skills. So polishing attributes of a sales call, understanding what are the value propositions for a sale. And really using all those key strategies to improve what we do which is increasing the market share of structural steel into every conversation, every group, every relationship we build." Hi, I'm Joe Thompson with NAHAD the Association for Hose and Accessories Distribution. I'm at our annual conference for all of our 900 attending members where Jim Pancero just finished delivering two outstanding UID in a Day sessions on Sales and Sales Management. I've worked with Jim for over 20 years and he's one of the top sales instructors in the country. I highly recommend that you consider Jim if your members are looking for exceptional sales training and sales expertise. Give me a call if you have any questions at the NAHAD office. Thanks a lot. "Winthrop hired Jim needing a message of uniqueness. And one of the things Jim was able to do, far better than we were able to do ourselves, was to be able to distill down the message to a simple concept that we can now replicate across our entire sales force." "The problem was we really didn’t know what we wanted we just knew that what we had wasn’t good enough. So, Jim actually came in, sat down with us, helped us figure that out and he’s been kind enough to come in and do two two-day sessions with our whole sales force. He covered a lot of different grounds and the nice thing is it’s not necessarily the information that everybody needs, but he’s found enough information to give everybody something to take home and make them better salespeople. So we look forward to working with Jim in the future." "In the day and a half we spent with him he's introduced a lot of neat concepts, a lot of impactful ideas and suggestions to help us make that migration from technically focused sales organization to an organization that's much more proactive. An organization that can demonstrate and illustrate value to the customers. It's really helped us to move to the next chapter in our sales evolution. I highly recommend Jim." "Jim obviously took copious notes from our lead up type discussions about our unique situation, and translated those into what I would consider a more customized approach to this training versus a set rote type of training, including the things that we needed to fit the umbrella of what he's trying to propose with the competitive advantage that he gave us through his training. The thing that really caught our eye was his insistence on the sales managers being involved, and ownership being involved for the stickability of this training. A little bit different than others we had talked to and also the advanced nature of what he proposed to give us a competitive advantage. During the training we had our challenge of our advanced sales pros going through their cycle of learning the material, buying into the material, and ultimately won them over by evidence by their taking notes and comments after the fact." "We've used Jim now two times and have finished a round with our 120 person sales force. If you're looking for sales training that's different than anything else you've probably ever done, it's not about tricks, it's not about gimmicks, not about the lastest trick close out there, but a real strategic way to go about planning and thinking about and then executing your sales strategy, then I think you need to call Jim Pancero. We see a benefit, we're seeing it already in our team, our team is responding to it. I've had our rookies thank me so much for the training, and I've had our veterans walk out feeling like they've really learned something new that they can help grow their market. So, where ever your team is, I would say this is not introductory training, this is higher level advanced sales training. If that's what you're looking for, than Jim's your man." We just completed two days of training with Jim, going over the sales process and some different techniques and really learned a lot. He made us think differently about our processes, think differently about how we interact with our customers, different ways of engaging the customers, thinking about the customer, communicating with the customer, and we’re really excited about putting those in place. Incredible, great two days of training and we’re excited to see so of the success that comes out of it. "We just finished a day with Jim. We've got an organization that's got several facets when it comes to sales. We have the technical sales guy, the immediate sales, day sales kind of individuals. Jim helped us look at how we do business across the different types of sales we do and gave us some really good tools we can use to get proactive, get out in the customer's office and try to promote ourselves in a different and better way that we don't think our competition uses on a regular basis. We're really appreciative of his day here and it's going to benefit us a great deal I think." My name is Isaac Oswalt. 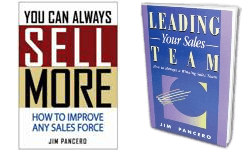 I’ve been able to work with Jim Pancero for a few different meetings now. I’ve learned a lot. And what I’ve learned most importantly is to keep things simple and to give something that’s actionable. So in a lot of his training he teaches on many different facets and then at the end he gives you things to deliver on, actually makes you do it and makes you perform, because we know none of this stuff matters unless you take action. So if you’re looking for some sales training, if you’re looking on how to sell to millennials and how to do this stuff, he’s very well versed. That’s coming from a millennial, I’m 35 years old, and I highly recommend him and he’s turned into a good friend. "Through Jim's training our sales force has had a great opportunity to really be able to focus on the customer and in the process determine what it is that we do uniquely so that we can really win in the marketplace. Both our company and our sales force is looking forward to the year that we're going to have, and our future, based on the training we have just completed with Jim Pancero." "We hired Jim Pancero to come in and give us some sales training. Our group has been in technical sales for many, many years and to try to overcome that we needed some expert assistance in that and Jim did a great job. He came and helped us, he challenged our thinking our thinking quite a bit. He started out by just a few phone call discussions to learn our business and from that he developed a workbook around our strategy and where we wanted to go with branding. Then he visited our shop as a follow-up so he could understand our business better and as a result he put a great program together for us. Many people enjoyed it. Just a half-day session, but fast-paced, kept it moving, very entergetic and very passionate about what he does. From it we learned we certainly have a lot of work to do, but we know the path we're going to be on and he developed a good map for us to get there. So, we thank him for all his time." "Hi, I’m Josh Coffman with Everglades Farm Equipment. We just used Jim Pancero for a four-day training session with our staff. We’re very excited about the program he put together and the industry knowledge he presented to us that helped break down some of our walls we had to the typical training stigmas. We were able to quickly move through the material and I feel we’re going to be a much better organization because of it." United Pipe & Steel Corp.
"Hi, this is Rick Hacker, Vice President with Pridestaff. We had the pleasure of bringing Jim back to our Pridestaff annual conference this year. The thing that’s great about Jim is his passion, but also the research, the knowledge that he knows about our company and so we can apply it directly to what we’re going to do next week. We loved everything he did, a lot of value, and a lot of fun. Thanks for everything Jim." Call us to discuss unique sales topics for your team!